PMN-caecilia is Linotype typeface designed in the year 1990 by Peter Matthias Noordzij (PMN). The font was named after the designer’s wife, Caecilia. The font is known for its humanist shapes and this makes it very easy on the reader’s eye. PMN-caecilia is more useful as a text typeface as compared to most of the slab serif designs. 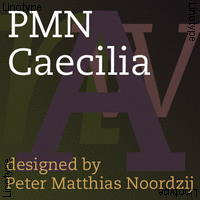 PMN Caecilia Std family is designed in a fashion to be used at a text size of 12.0 points.